It seems all the Vancouver Canucks needed to start winning again was a new month. The Canucks beat the Philadelphia Flyers 5-1 on Saturday night at Rogers Arena, their fourth win in five games. They were winless in 10 of the previous 13 games. As the home team has done so often this season, they played an uptempo brand of hockey. But they also led from the start on this night, something that they’d done in only 14 of their previous 34 games. 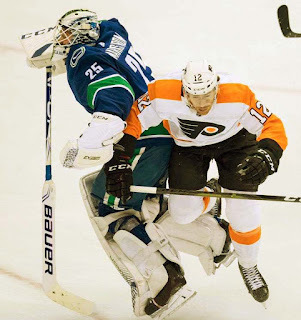 The Canucks weathered an early Flyers storm around Jacob Markstrom’s crease before finding the game’s first goal, a fabulous foray towards the Philadelphia net by one of the Canucks’ least-likely candidates: Chris Tanev. It was the veteran’s first goal of the year and the sensation of it was a sign of things to come. Vancouver Canucks goalie Jacob Markstrom, left, of Sweden, and Philadelphia Flyers’ Michael Raffl, of Austria, collide after Markstrom came out of his goal to play the puck during the second period of an NHL hockey game in Vancouver, on Saturday December 15, 2018. The Flyers were awful in their own end, leaving Flyers starter Aaron Stolarz hanging more than once and the Canucks took advantage twice more. The Canucks got three first period goals from Tanev, Loui Eriksson and Josh Leivo. The fourth came from a fantastic set-play off a faceoff, with Brock Boeser one-timing a slap shot from out high through a screen and past Philadelphia goalie Alex Lyon. The fifth goal was an empty-net tally by Markus Granlund. The Flyers got their lone goal late in the first, Scott Laughton who deked past Canucks defenceman Derrick Pouliot and then goalie Jacob Markstrom. The defensively-minded defenceman had tallied just 18 times before Saturday night. 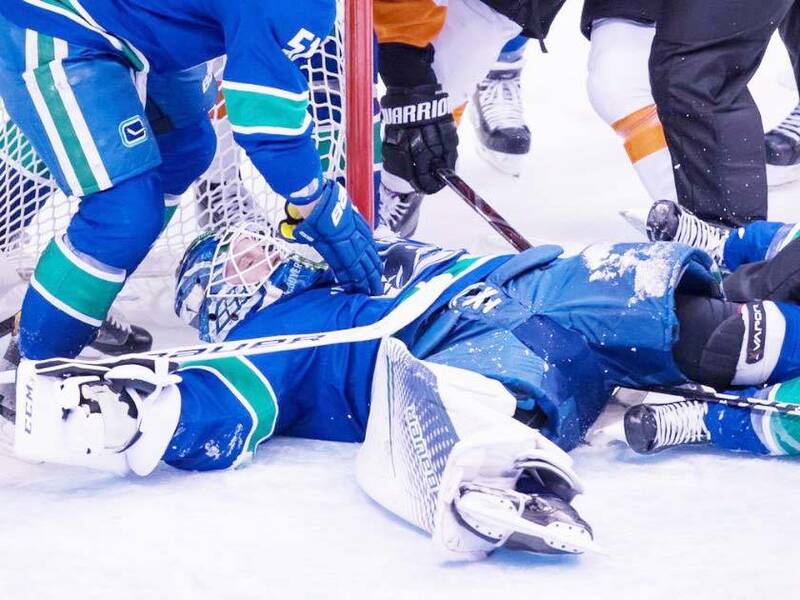 The best suggestion came courtesy of TSN 1040’s Jeff Paterson who recalled Tanev’s sensational overtime winner in a December 2014 game that also saw Jannik Hansen taken to hospital. Two days later, Hansen dead-panned to Paterson that when a nurse told him of Tanev’s game winner, he asked for more medicine. With Brandon Sutter likely returning after Christmas, Adam Gaudette may soon be headed back to the American Hockey League. He’s not making the choice easy. Skating on the third line with Antoine Roussel and Loui Eriksson, the Hobey Baker winner from last season had perhaps his strongest game of the year. He picked up an assist on the Eriksson goal, was confident with the puck through the neutral zone and was solid in his own end to boot. 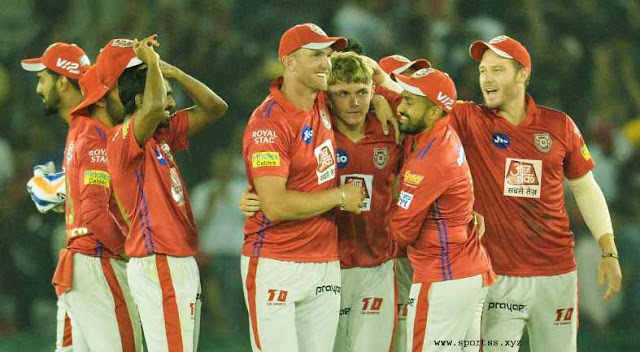 His play has drawn praise from his coach. There are still things to work on, but there’s little doubt the Canucks are happy with where he’s at. Fitting him into the lineup next season is going to force some decisions. 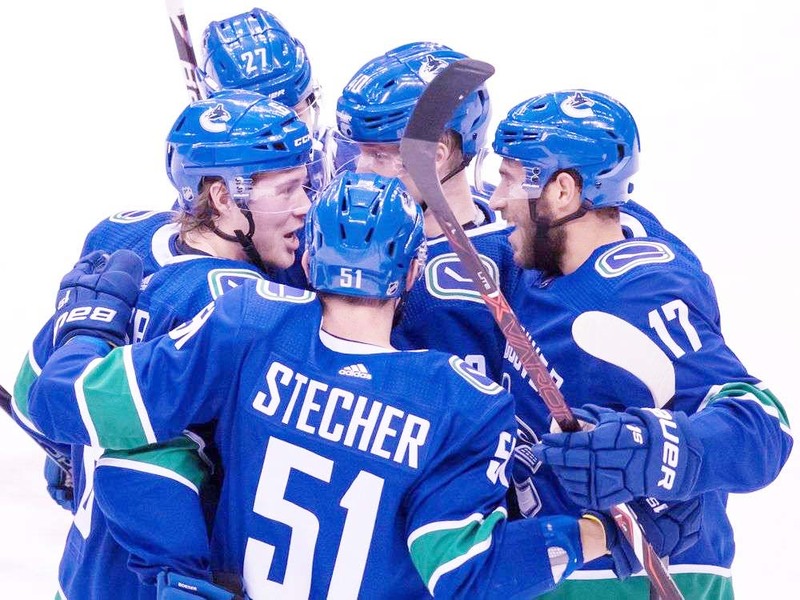 Vancouver Canucks’ Brock Boeser, clockwise from left, Ben Hutton, Elias Pettersson, of Sweden, Josh Leivo and Troy Stecher celebrate Boeser’s goal against the Philadelphia Flyers during the second period of an NHL hockey game in Vancouver, on Saturday December 15, 2018. 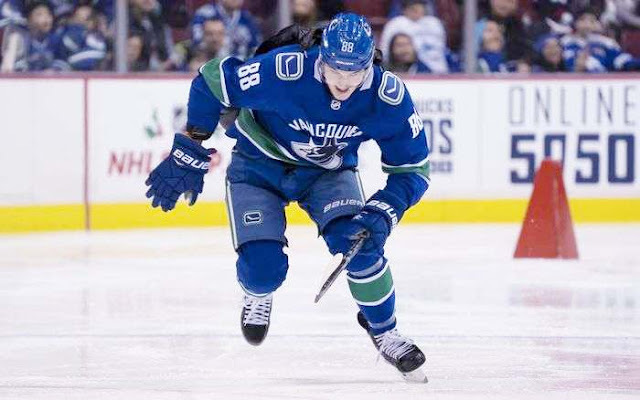 With the Canucks getting contributions from all corners, it was easy to miss Elias Pettersson on this night. But he still got an assist, winning the draw that led to Boeser’s goal. Pettersson now has points in six straight games. Flyers starting goalie Aaron Stolarz was chased from the game after the Canucks’ second goal. It turned out to be for an injury. In came Alex Lyon, the Flyers’ fourth-stringer, who had given up four goalies in a lone period of action this season. That forced the Flyers into emergency goalie mode: they brought in UBC netminder Rylan Toth. Toth played three years in the Western Hockey League — two seasons in Red Deer and another in Seattle — and is now in his second year the University of B.C. Flyers coach Dave Hakstoll called a timeout with his team trailing 4-1 but on the power play with just under six minutes left. Shortly thereafter, he pulled the goalie. It didn’t make much difference as the Canucks potted their fifth of the game, Markus Granlund sent out on a break by Tyler Motte. Philadelphia Inquirer columnist Sam Donnellon, asked about whether Hakstol could get fired during the intermission following his team’s latest dismal start to a game, quipped that this was a question that has been broached in every press box he’s visited on the Flyers’ five-game trip. “Five for five,” he said.